— When working in an office setting, stand up and stretch often. — Planning meeting for interprofessional education and interprofessional practice, 3:30 p.m. Aug. 15, room TBD. Contact Linda Sealey, Ph.D. Open to UCO faculty and staff. — College of Liberal Arts beam signing event, 3 p.m. Aug. 14. — Oklahoma Teachers Retirement System Pre-Retirement Sessions, 8:30-10:30 a.m. and 11 a.m.-1 p.m. Oct. 13. Register online. 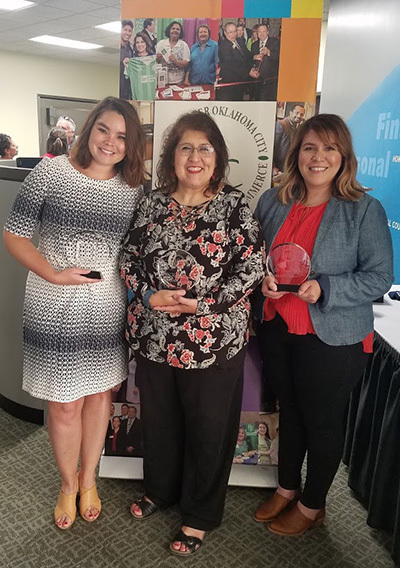 UCO faculty graduate from Latino Leadership OKC — Three UCO faculty members recently graduated from Class V of the Latino Leadership OKC Program (LLOKC). LLOKC is a six-month leadership program of the Greater Oklahoma City Hispanic Chamber of Commerce. Over the course of the LLOKC program, participants learn and practice the tools for being effective and engaged community leaders. From left are Class V graduates Alyssa Provencio (Political Science and Edu-Innovator), Regina Lopez (Curriculum & Instruction) and Iliana Rocha (English). The Technology Resource Center has reserved the following dates for faculty to receive individualized D2L assistance. Appointments are encouraged to avoid wait times but are not necessary. 9 a.m.-5 p.m. Friday, Aug. 24. To schedule a consultation, email the Technology Resource Center or call 405-974-5595.